In our previous article, we offered some tips to improve user adoption rate even prior to the implementation of a new CRM solution. 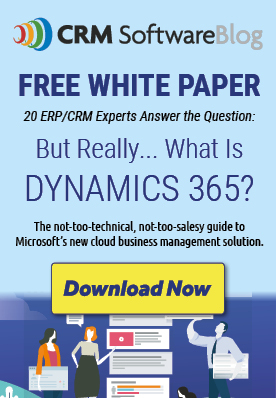 That said, proper training tailored to the specific needs of end users is essential to ensure a high user adoption rate for a new CRM solution such as Microsoft Dynamics 365. The users of the solution need to become familiar with its features and processes before they can leverage its benefits to increase their productivity. No matter how much money your organization invests into a new system, if the training fails to address users’ specific realities, they will simply revert to their old habits. The next 5 tips will help you tailor your user training to ensure that this doesn’t happen and that users obtain a full understanding of the system and how it will simplify their daily tasks. Give all users an overview of the system. Even if each team only uses part of the system, it’s important that all users get a feel for the entire system and navigate through it. Knowing how the entire system works will help them learn the processes relevant to their specific responsibilities and how they relate to other departments. Show users how the new solution can facilitate their daily tasks. If possible, introduce them to personalized dashboards and views, as well as advanced searches, so that they are aware of how the system can be tailored to meet their specific needs and facilitate the experience. Use customization options to reduce the time spent navigating between entities or records. Split training into small teams. This way, the training can be tailored to the users’ specific needs, roles and tasks, ensuring that the information is relevant. Moreover, users will be more likely to ask questions and pay attention if they are a part of small group. Prioritize tasks and set clear goals for the utilization of the CRM. Having clear objectives and tasks to master before moving on to the next will help users focus on what has to be learned. It also makes it easier to assess whether they fully understand how processes work, making it easier to define and adjust the rest of the training. Have your super-users give the training. At this point, user questions are usually more about the process and less about features. The super-users of the solution are in the best position to guide end-users through the process and ensure that they have fully internalized it prior to using the solution for their day-to-day activities. By getting the proper training, your end-users will be able to leverage the functionalities and potential of the new solution to carry out their daily tasks and activities and improve their productivity. Should you find yourself in need of advanced or tailored training sessions, please communicate with JOVACO for more information about our CRM and Microsoft Dynamics 365 training sessions.